Home » Food and Nutrition » Is a High-Protein Diet Bad for Your Health? High-protein diets have come under fire from a number of angles for as long as I can remember. Some doctors suggest that eating too much protein leads to kidney damage, while vegans and vegetarians cite various dangers associated with animal proteins, including cardiovascular trouble, cancer, and weight gain. So, is it true; is too much protein bad for you? I’ve never bought into any of it; I still think a high-protein diet offers a number of benefits. In fact, I believe that it leads to cardio-metabolic benefits and an improved cholesterol profile and reduces the likelihood of obesity and many of its associated health risks. And I can back that up with some recent research. A brand new study soon to be published in TheAmerican Journal of Clinical Nutrition concluded that diets high in animal and plant protein are associated with less risk of obesity and belly fat and higher levels of healthy HDL cholesterol and that they do not impair kidney function. That’s just one of many studies that show protein-positive diets in a good light. I’ve never really understood why protein gets such a bad rep. It’s been proven a number of times that animal products do not contribute to higher levels of “bad” (LDL) cholesterol, but rather that it’s refined carbohydrates doing the dirty work. And as far as weight gain goes, calories from proteins require your body to work harder to break them down, thus utilizing calories in order to boost absorption. For every 100 calories of protein you eat, for example, your body only absorbs 70 or 80 of them, because 20-30 calories are used during digestion. Protein has also been proven to a satiating effect, doing a better job than other foods of regulating appetite and making you feel full throughout the day. This leads to less snacking and a reduced chance of overeating. Studies have shown that getting 30 grams of protein in the morning regulates hunger hormones that can in turn regulate your appetite throughout the entire day. 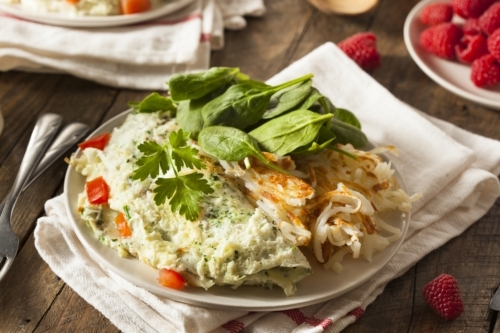 Breakfast: Egg white omelet, made with a half cup of egg whites, one whole egg, and veggies of your choice. Cook it in olive oil and have a side of whole-grain or rye toast. Mid-Morning Snack: Half a cup Greek yogurt with some nuts and berries mixed in. Lunch: Four to five ounces of chicken breast or salmon fillet on spinach salad with balsamic vinegar, olive oil, and chopped veggies. Mid-Afternoon Snack: Protein shake with quinoa salad and an apple. Dinner: Lean beef hamburger with a whole grain bun or a steak with sweet potato and broccoli, with fruit salad for dessert. High-protein diets are healthy; learning how to build a high-protein diet can improve your health quickly and easily. Use my sample menu as a template and test it out! Berryman, C., “Diets higher in animal and plant protein are associated with lower adiposity and do not impair kidney function in US adults,” American Journal of Clinical Nutrition epub, July 27, 2016; DOI: 10.3945/ajcn.116.133819.